Dipper Pines is one of the main characters that appears in Gravity Falls. Smart and conventional, Dipper Pines can't wait to leave adolescence in the rear-view mirror. Born adventurer at heart, Dipper can't sit still and is always looking for the next riddle to solve. His scrupulous attention to detail comes in handy when he is off figuring out the mystery of the day, but sometimes his overzealousness leaves others questioning his credibility. He is wise beyond his years, and his refusal to sit still when there are puzzles to be solved, leaves him restless in everyday situations. He first arrives in Gravity Falls upset with going to a small, boring town, with his twin sister Mabel for the summer, but because of interest in mysteries and lust for adventure he starts to adjust to life in town and tries to solve mysteries, with his twin sister coming along for the journey. He is somewhat protective of his sister, whenever she is in danger he is always there to help and will do anything to get her free. He also hates being called cute and adorable, as he wants a more grown-up and mature appearance to strangers. Sometime during the month of June, Dipper and his twin sister Mabel were sent from Piedmont, California to the town of Gravity Falls, Oregon to visit their Great Uncle Stan, Dipper found it difficult to get used to his new surroundings. One day, he was assigned by Grunkle Stan to hang up signs advertising the Mystery Shack in the "spooky" part of the forest, where he ended up finding a book describing and explaining many secrets and dangers of the town. He immediately told Mabel about the things he learned from the book, and consecutively found out that Mabel had met a teenager named Norman, who he quickly suspected as being one of the undead, described in the book. He attempted to film incriminating evidence to support his accusations, and despite being unable to find any, he told Mabel about his suspicions, resulting a argument between the two. During Norman and Mabel's date, he nearly accepted that Norman wasn't a zombie. However, while reviewing the footage, he noticed Norman's hand falling off and him nonchalantly placing it back on, and feared that his sister was in grave danger. Using a golf cart he received from Wendy, he quickly headed to rescue Mabel, upon finding her, he realized that Norman was actually a group of gnomes residing in the forest, who planned to kidnap Mabel, and force her to become their queen. He managed to subdue the gnomes and escape with Mabel, but they were pursued by a large monster that the gnomes came together to form. The two ended up crashing the golf cart upon arriving at the Mystery Shack, and were cornered by the monster. The head gnome, Jeff, informed them that they would do "something crazy" unless Mabel became their queen, and in response, Mabel agreed, much to Dipper's dismay. Shortly after Mabel accepted the gnomes ring, she used the leaf-blower to defeat the gnomes, impressing Dipper in the process. With all the gnomes finally gone, the two made up and entered the Mystery Shack. Grunkle Stan allowed them each one free gift, with Dipper choosing a new hat to replace his old one. Before going to bed, he wrote a new entry in the Book, stating that he knows Mabel will always have his back. Dipper also goes fishing with Grunkle Stan and Mabel as a family bonding Dipper looking for the Gobblewonker on fishing day. When he hears that there is a lake monster in the sea named The Gobblewonker, Dipper and Mabel want to go find it and get the proof. Dipper wants to be the first to discover it so he can win the prize money and appear on TV. They ditch Grunkle Stan and go with Soos to find it. Dipper brings 17 cameras just in case. In the end, the Gobblewonker turns out to just be an old man looking for attention. 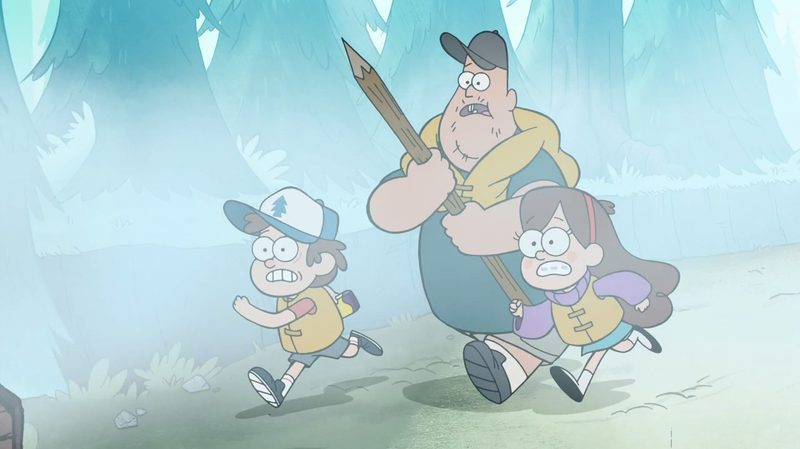 Feeling bad, Dipper and Mabel go back to Grunkle Stan to have their family bonding day. After telling him Mabel no longer wanted to date him, 'Lil Gideon lurred Dipper into a room to attack him. Dipper discovered that 'Lil Gideon had an amulet that had power to let him do it. 'Lil Gideon could almost control Dipper with it. Mabel had to come and save Dipper from 'Lil Gideon. To do so, she had to break his amulet. Dipper and Mabel pretend to be 13 so they can go to the haunted conviencence store, Dusk 2 Dawn with Wendy and her friends. He is playing around in the store when he goes to get more ice. He then sees a headless brain with bloodshot eyeballs staring back at him. He screams, and opens the fridge door again. Surprisingly, the figure was gone. Everyone goes back to see what it was about. He distracts them by pointing out the game Dancy Pants. Eventually, the group stumbles upon a chalk outline of two bodies. Dipper lays in it, and the outline turns green and the lights go out. One after one, almost all of Wendy's friends dissapear. The store then turns upside down, with the ghosts controlling Mabel. Dipper then realizes that the reason the ghosts were upset was because they were all teenagers. He goes up to the ghost and tells him he's not a teenager. He's only 12. Dipper then asks if there's anything he can do to help his friends, so he must perform the Lamby Lamby Dance. After doing so, the ghosts lets everyone free. Dipper's special skills include, monster hunting and puzzle solving. Dipper wears a trademark blue and white hat with a blue brim and blue pine tree on the front. He has brown hair and relatively pale skin. He wears a navy blue vest, red-orange shirt, gray shorts, white socks, and black sneakers. He is sometimes seen with a green backpack. His first cap was army green and had a star on it.